I love pizza. Who doesn't? Sometimes I want a fancy pizza from California Pizza Kitchen. Sometimes I want Pizza Hut (love their new garlic hand tossed crust!). Sometimes I just want a quick and basic (or "hot and ready") pizza from Little Caesar's. But the best pizza ever is homemade. I've made a lot of different types of pizza. I recently improved my whole wheat crust recipe (blogged about in the previous post, which you can find here). It's light and fluffy, and my husband couldn't stop talking about how good it was. 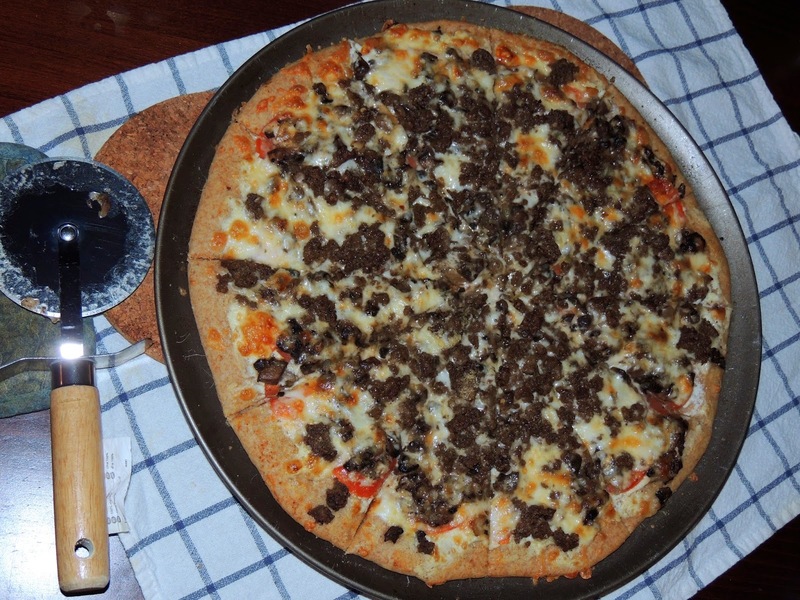 Well, to top it off, I came up with a recipe for pizza that in my opinion is truly the best. If you like white pizza, you'll love this pizza. I'm not really a fan of tomato sauce on pizza. I prefer fresh tomatoes, but I also know that pizza crust tastes better with a little something on it in place of the sauce. I've used BBQ sauce, pesto, and wing sauce (this one most frequently), but recently I've discovered something even better. I just lightly brush the crust with olive oil, sprinkle that with garlic and salt and top that with a thin coating of ricotta cheese. It's amazing and goes well with so many other toppings. I use that "sauce" on the pizza recipe below. 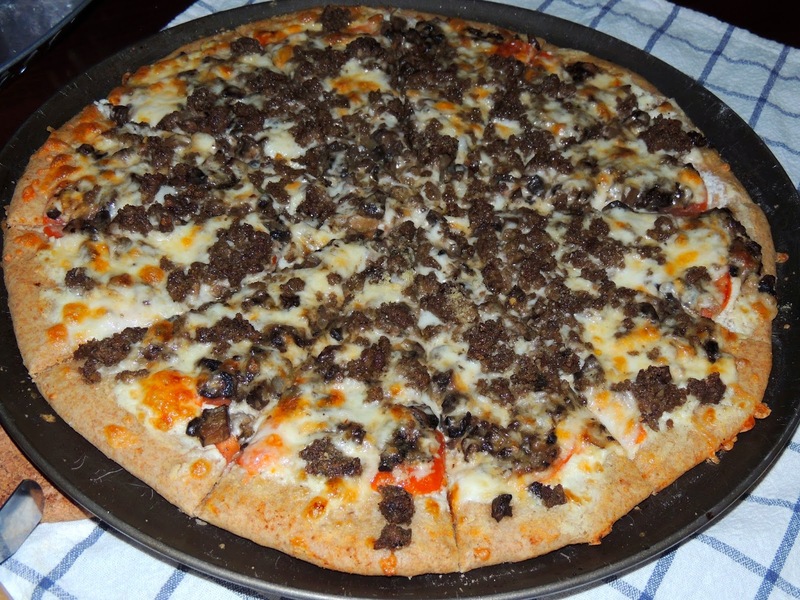 When you add onions, mushrooms and homemade beef sausage, it just really can't be beat. I hope you enjoy it as much as I do! Cook the mushrooms and onions in a frying pan until caramelized and all the liquid is removed from the mushrooms (otherwise you’ll have a soggy pizza). Sprinkle with TexJoy Spicy Steak Seasoning. Mix the ground beef with the TexJoy Sausage Seasoning and cook in another frying pan. Crumble as it cooks. Roll out the crust. Drizzle with olive oil and brush just to coat the crust. Sprinkle with garlic and salt. Spread ricotta cheese over crust. Arrange tomato slices evenly over ricotta and sprinkle with salt. Sprinkle a little of the mozzarella cheese over the tomato slices. Top evenly with the mushroom and onion mixture. Sprinkle with the rest of the mozzarella cheese. Top evenly with beef sausage. Sprinkle with Parmesan. Bake for 10 minutes or until crust is slightly browned and cheese is golden.